Leaves for Trees: I am asking for too much? I suppose that I can be selfish sometimes. After all, I am only human. But I am beginning to wonder if I am unnecessarily selfish when it comes to genealogy. This thought came to my mind as I was reviewing some of my past genealogy board posts. 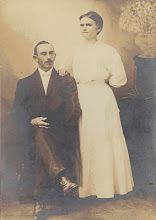 I have made many, many posts on countless different genealogy boards on Rootsweb.com, Genealogy.com and others. Every time I make a request I ask simply for information on a specific ancestor and provide as much information about the individual as I have. My goal in posting is to find out as much as humanly possible about a person. What better way to do so then to connect with a fellow researcher interested or knowledgeable on a similar surname or locality? Most often, if I receive a response at all, the individual is informative and helpful. I have even made connections where individuals provide me with copies of ancestral files. But I have received enough responses that I consider to be a little "short" with me and my request that I want to know if I am breaching some sort of board posting etiquette. I received one response where the individual reprimanded me for not narrowing down what I was looking for. Herein lies the rub. If I were only looking for an individual's death date, I would say so. But I am interested in all facets of an individual's life and would rather have the fire hydrant of information then a small trickle of water. Is this really asking too much? Thank you! I appreciate it and thanks for checking out my blog!